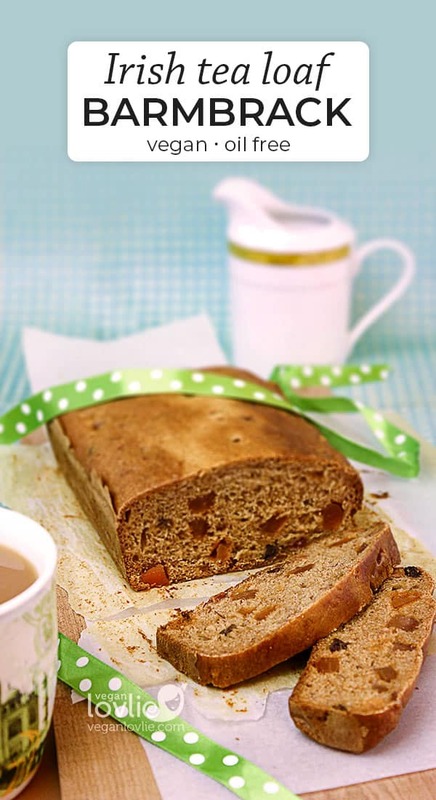 A rich fruity Irish tea loaf that is also known as a barmbrack. 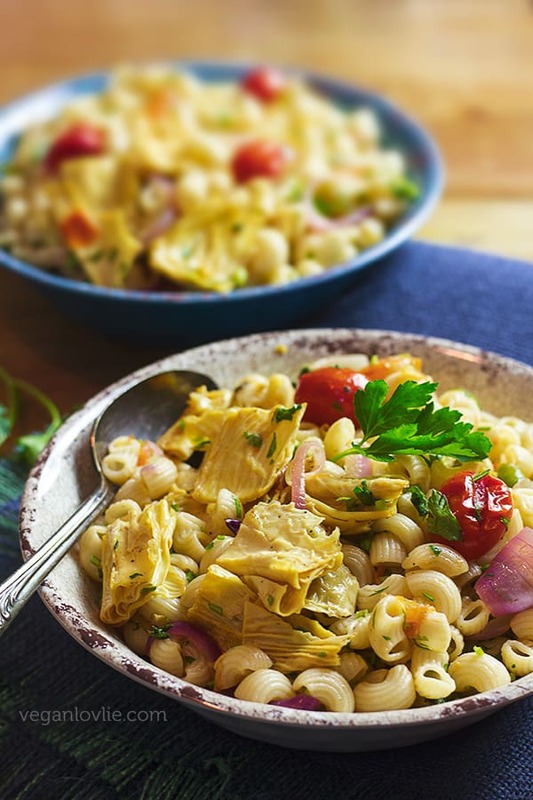 This is a vegan eggless and dairy-free version that is also oil-free. 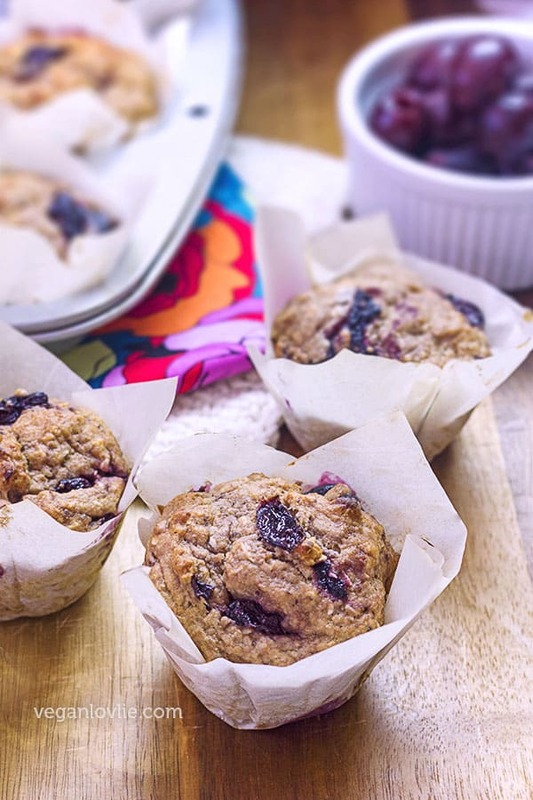 It’s great for breakfast or tea time. Mesmerized by the heart wrenching melodies enlivened with interludes of exuberant toe-tapping music, I was eager to climb on the highest spot I could find to have a better view of the carnival as characters, all mostly clad in green, marched down the streets of Dublin city. It was the first St. Patrick’s Day celebration I had ever witnessed in 2009 when I was in Ireland and I remember everything as clear as if it was yesterday. The infectious energy, warmth and humour of the carnival mixed with the joyous crowd was quite an enthralling experience. There is something just magical and timeless about Ireland that made the years that I spent there enchantingly unforgettable. Is it the soul mending ethereal aspect of their traditional music or the spellbinding majesty of the breathtaking sceneries that you can marvel at as you move outside of Dublin city? I cannot describe the deep serenity that exists in some of the places I had the chance to visit. My reminiscent mood this week got me into making a few Irish treats that remind me so much of the time I spent there. 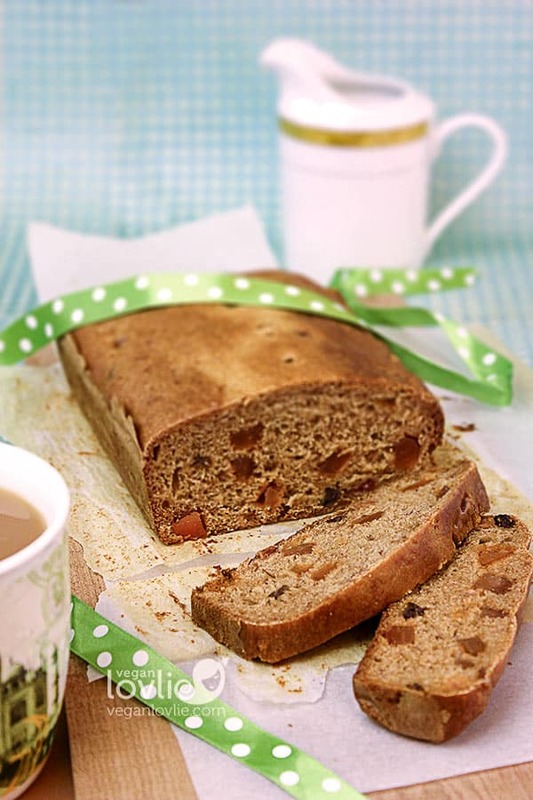 The Irish tea loaf is a traditional Irish fruitcake, also known as Barmbrack or tea brack, that I used to buy in the grocery stores; there were one or two brands that carried a vegan version. 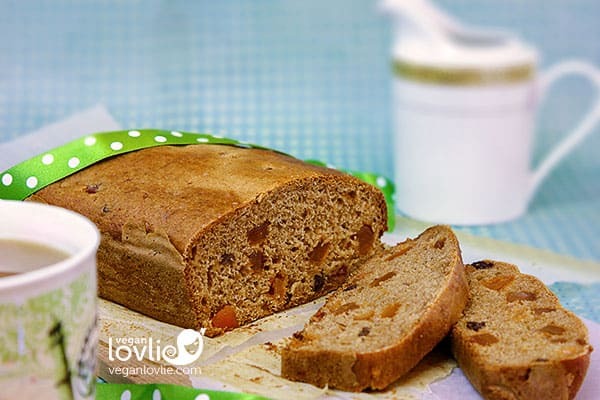 I have actually shared a recipe for this tea loaf previously but this time I made a few modifications to the recipe with the addition of baking powder to make a softer loaf and I have also reduced the sugar. 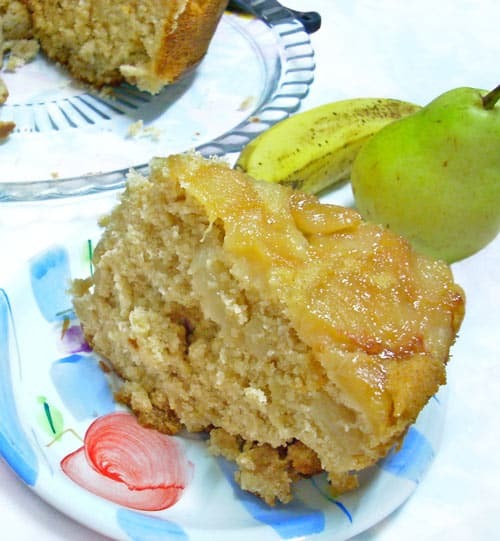 The previous recipe was a tad bit too sweet as the dried fruits contribute much to the sweetness already. This loaf is lighter than a cake with no added oil and can be enjoyed with a nice cup of Irish tea. Much of the richness of this brambrack is due to the dried fruits that are steeped in cold tea overnight to soak up all the goodness. Some people add a little whiskey into the tea but I decided to opt out of it. You may add a tablespoon or two if you wish to live up to the tradition of Paddy’s Day. Place the dried fruit in the cooled black tea and put it in the refrigerator overnight or leave it out to soak for at least 4 hours. In a mixing bowl, place the flour, salt, baking powder, sugar and the spices. Mix well and break all the sugar lumps if necessary. Make a well in the centre, add the mashed banana. Then strain the liquid from the tea-fruit mixture and pour the tea into the bowl. Mix the wet ingredients with the dry until a smooth batter is obtained. Now add all the fruits and give everything a good mix. Pour the batter into a lined baking loaf tin. (You do need to line the tin with parchment paper as there are no oil in this recipe and it will be difficult to get the baked loaf out otherwise). Bake for 40 minutes to 1 hour (depending on your oven) or until a toothpick inserted in the middle comes out clean. This loaf tastes better after two days. So, you may want to keep it in an airtight container for 2 days before serving, that is if you can. 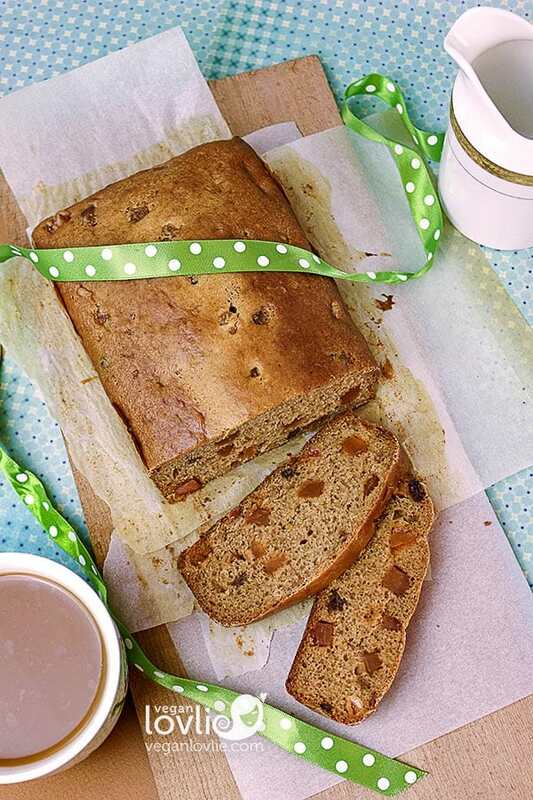 This fruity Irish Tea Loaf (Barmbrack) is made with strong black tea and can be enjoyed at any time of the day with a nice cup of tea. Pin this recipe for later. Come pin along with us and follow us on Pinterest. Lovlie I wanted you to know that I made your sweet potato flat bread and it was wonderful. thank you. So glad to hear this Millie. 🙂 I hope you are doing well. It's a great snack too. In Ireland, they make a round version more often and it goes by different names. I've seen it labelled as fruit brack too. I love tea loves – so simple, so delicious (and who doesn't love another way to get tea into their diet!) I have a strange fear of mixed dried fruit, but I'd love to make this with sultanas instead!